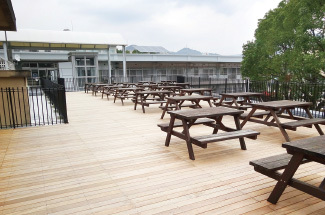 The wooden deck is in harmony with the surrounding greenery. A meeting of Board of Directors decided out that a special room that can be used by 40 people would be used for the faculty members during lunchtime (11:00–14:00), and would be opened for students other than lunchtime hours. Bunkyo Campus of Nagasaki University is the location of School of Global Humanities and Social Sciences, Faculty of Education, School of Pharmaceutical Sciences, School of Engineering, Faculty of Environmental Studies, Faculty of Fisheries, and the university headquarters. It is the largest campus of Nagasaki University with around 6,500 students and faculty members. 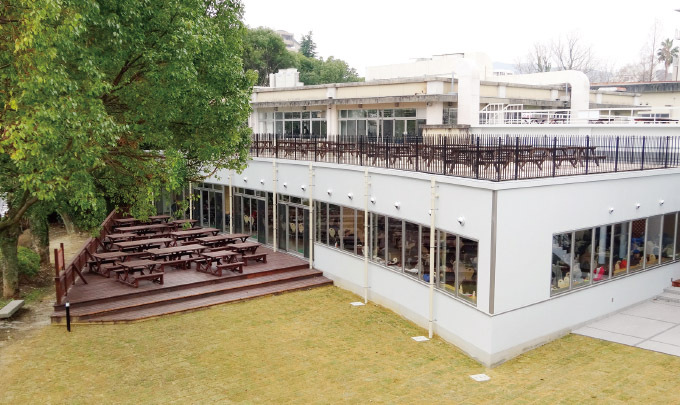 Before the expansion, Bunkyo Cafeteria is a two-storey bulding that holds 520 seats on the first floor, 202 seats on the first floor’s wood deck, 382 seats on the second floor, totaling 1,104 seats. We received a lot of opinions through Hitokoto Card (member’s opinion card) and General Meeting of Representatives, stating that the cafeteria is too crowded. 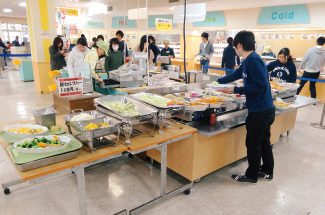 A questionnaire about welfare programs/facilities with around 1,300 respondents held jointly by the university and co-op, the majority of the respondents asked for an expansion of Bunkyo Cafeteria. At the regular meeting with the university, we conveyed the students’ opinion, and at the extraordinary general meeting, we agreed upon the university donation and got affirmative resolution for the expansion of Bunkyo Cafeteria from all members attending the extraordinary general meeting. 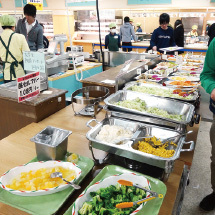 Based on the resolution, we proposed the extension of cafeteria hall to Nagasaki University. 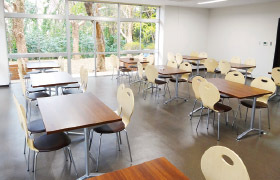 The university approved the extension plan, thus the newly extended cafeteria hall began its operation on November 1st, 2014. 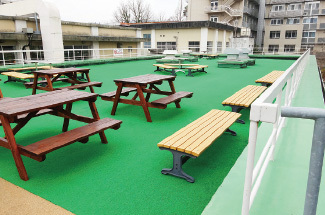 Now, Bunkyo Cafeteria holds 763 seats on the first floor, 74 seats on the first floor’s wood deck, 382 seats on the second floor, and 38 seats on the rooftop, totaling 1,347 seats (an increase of 243 seats). One of our tasks in the future is to consider the multipurpose function of the extended hall, by consulting with co-op members and the university. A smooth flow from food counter to cash register, then to the table. The rooftop is a relaxing space that offers an open atmosphere. This place is crowded with students in lunchtime and between classes.